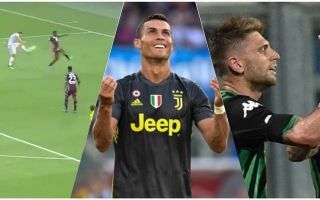 Serie A returned with a bang this past weekend with Cristiano Ronaldo’s highly-anticipated Juventus debut dominating the headlines on Saturday. The Portuguese superstar didn’t get on the scoresheet for the Bianconeri and did in fact spurn some great chances, but given the reigning champions were 2-1 down with half an hour to play, they would have been relieved to have merely come away with three points. All eyes were on Ronaldo, but it was Federico Bernardeschi who bundled home the winner in injury time for the visitors to leave Chievo heartbroken as they surrendered a 2-1 lead to lose 3-2. It was far from a convincing performance from the Turin giants and Massimiliano Allegri will expect them to improve significantly moving forward, particularly the partnership between his new marquee signing and Paulo Dybala in the final third. Nevertheless, one man who didn’t enjoy Ronaldo’s debut was Chievo goalkeeper Stefano Sorrentino, who was left nursing some painful looking injuries after a clash with the Portuguese superstar, as seen in the images below. A fractured nose, whiplash and a bruised left shoulder. Pure magic. The 32-year-old has scored some wonderful goals in his career, and he’s added another to the catalogue with this effort as he sealed all three points at Torino. In truth, Eusebio Di Francesco’s men were toiling and looked set for a share of the spoils, but when you’ve got such quality up front in the form of Dzeko, there’s always a chance of finding a breakthrough. His strike against Chelsea in the Champions League last season was a recent reminder of his class, but he proved it once again with this goal to get Roma off to a winning start. Changing and adapting away from Maurizio Sarri’s style, question marks were arguably fairly raised over Napoli and how they would react with Carlo Ancelotti at the helm. They didn’t disappoint, as after falling behind at Lazio, two excellent goals from Arkadiusz Milik and Lorenzo Insigne turned things around against Simone Inzaghi’s side to hand them a winning start. As seen in the video below, Napoli are still playing some wonderful football in the final third, and they’ve made an early statement to suggest that they will continue to battle at the top of the table having perhaps emerged as the most impressive side from the opening weekend. In complete contrast, it was a disastrous start for Inter who after an impressive summer in the transfer market have been tipped by many to launch a Scudetto bid while also returning to the Champions League this season. Based on this performance, they’ll have their work cut out as they were second best for most of the first half and while they did have their chances after the interval, it wasn’t enough to prevent Domenico Berardi’s penalty from sealing a win for the hosts. Sassuolo have emerged as somewhat of a bogey team for the Nerazzurri, winning five of their last seven meetings. Now, they’ll have to bounce back and prove that it was a minor blip to start the campaign. *Milan-Genoa and Sampdoria-Fiorentina postponed due to bridge collapse tragedy in Genoa.